The recent spike in botting caused by the exhumer rebalance is difficult for highsec miners to ignore. Of course, it can be difficult to tell the difference between a botter and an ordinary miner these days, given how little an AFK miner contributes to the EVE community. The lack of any distinction between the bots and bot-aspirants has tempted many miners to join the dark(er) side. 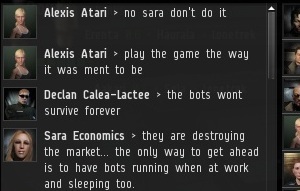 Even a pillar of the highsec mining community such as Sara Economics (posting here on alt Amy Economics), has been drawn toward the siren song of the bot. Ms. Economics is viewed by many rebellious miners as a leader of the anti-New Order movement in the Kino system. While these miners may point to her as a shining example, we know better. Sara has a rap sheet as long as my arm: She was implicated in the plot to get me permabanned from EVE, joked about the possibility that I might commit suicide in real life, and helpfully chimed in on what Kino miners called the "conspiracy to eliminate James 315". But now her refusal to join the New Order of Highsec has led her down a truly twisted path. As everyone understands by now, AFK mining is a gateway drug for botting. It's absolutely essential that miners follow the New Halaima Code of Conduct if they are to remain sober. Let's continue to bump them in the right direction! I admire how you and the vast majority of your agents can keep such a calm and courteous demeanor when facing people that are actively working on slowly debasing the sandbox this game is supposed to be. "Sara Economics > they are destroying the market... the only way to get ahead is to have bots running when at work and sleeping too." I head to reread this passage several times, just to be sure that i wasn't misinterpreting what i had just read. How deep must the corruption run in this ones mind, how skewed the perception and twisted the morale from the time spent being a bot that she would not even see the irony in that? "Sara Economics > they are destroying the market... [...]." - to still have the audacity to distinguish between her abrasive, corrosive "actions" which are bot in nature and the use of third-party software? There have been many entertaining articles on here. Some were enlightening, some were simply a delightful read; some were business in nature, some were casual fun. A few even gave the reader a glimpse into the bot-aspirant mindset. But this one took me aback. It laid bare the gaping abyss which lies at the rotten core of the AFK-mining lifestyle. Sara Economics: you're not "on the fence" of looking into third party software, but you're on the verge of becoming the handful of lines of cold code, soul disconnected, which you so aspire to be. Very well said. I hope this somehow reaches her, or at least provides an example for others in her situation. This is the valley. She can't fall much lower than this. Man, can anyone be the epitome of what is wrong with High Sec more than Sara Economics? I just hope we can save her before it's too late. 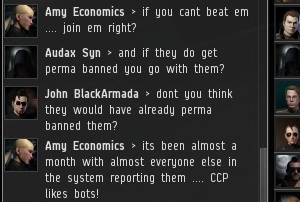 I choose to believe there's hope for every miner in highsec. The alternative is unthinkable! 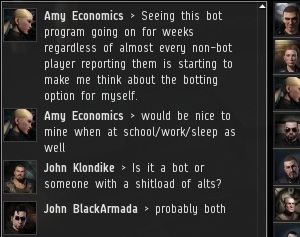 If we have to choose between a bot-filled, dull EVE where the new players can't earn enough ISK through mining to buy a better ship for whatever they want, or an AFK-mining and bot-free EVE, where miners are in danger of being ganked and bumped at any moment and mining is actually profitable for new players, I don't think it's hard to choose. I won't call James a god. He's more of a self-sacrificial hero, really. He's like Jesus, doing what's best for the wellfare of the community as a whole (and at no point does the Bible say Jesus didn't bump miners, so that's no excuse). The average High-sec miner just doesn't realize it. Yes, I used to loathe James, but in the light of his actions, I've realized that he's not that bad, really. The high-sec miners are much worse. "...in light of his actions, I've realized that he's not that bad, really. The high-sec miners are much worse."